University Press of Kentucky, 9780813169729, 200pp. The battle of the Crater is known as one of the Civil War's bloodiest struggles -- a Union loss with combined casualties of 5,000, many of whom were members of the United States Colored Troops (USCT) under Union Brigadier General Edward Ferrero. The battle was a violent clash of forces as Confederate soldiers fought for the first time against African American soldiers. After the Union lost the battle, these black soldiers were captured and subject both to extensive abuse and the threat of being returned to slavery in the South. Yet, despite their heroism and sacrifice, these men are often overlooked in public memory of the war. 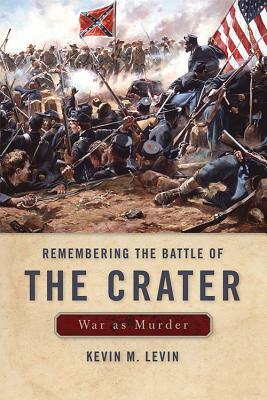 In Remembering The Battle of the Crater: War is Murder, Kevin M. Levin addresses the shared recollection of a battle that epitomizes the way Americans have chosen to remember, or in many cases forget, the presence of the USCT. The volume analyzes how the racial component of the war's history was portrayed at various points during the 140 years following its conclusion, illuminating the social changes and challenges experienced by the nation as a whole. Remembering The Battle of the Crater gives the members of the USCT a newfound voice in history.